Russ Bassett ProMedia Cabinets provide secure LTO storage for LTO media stores stored with or without their jewel cases. ProMedia Cabinets are available in three different height sizes. Interlocking drawers and turn-key locks provide safe and secure storage of valuable media tapes whilst full width, recessed drawer pulls provide convenient access to stored tapes. Fully welded construction means that the Russ Bassett ProMedia Cabinets will provide years of lasting media storage service. 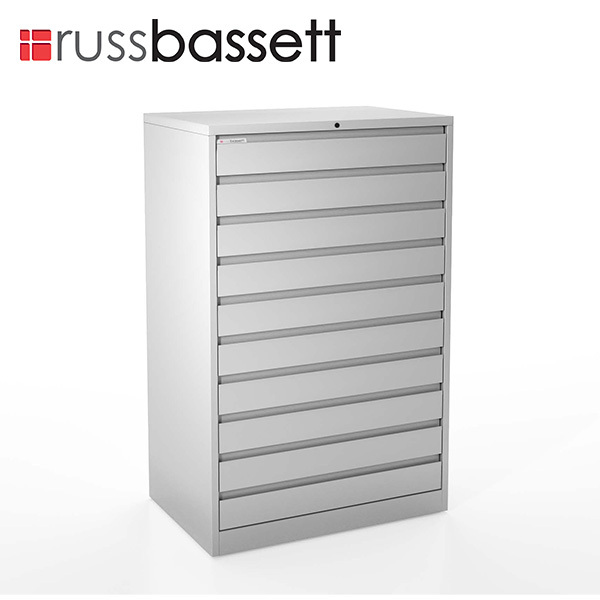 Russ Bassett ProMedia Cabinets are a range of three different sized cabinets specifically designed to store LTO media tapes. The cabinets are all 36″ (914mm) wide and 24″ (610mm) deep, and then available in three height sizes. The short height cabinet is 29″ (737mm) high, the medium cabinet is 39″ (991mm) high and the tall cabinet version is 56″ (1,422mm) high. Russ Bassett ProMedia Cabinets provide LTO storage for LTO tapes with or without their jewel cases. The tallest Russ Bassett ProMedia Cabinet stores a maximum of 1,200 LTO tapes with jewel case or 1,560 LTO tapes without jewel cases. 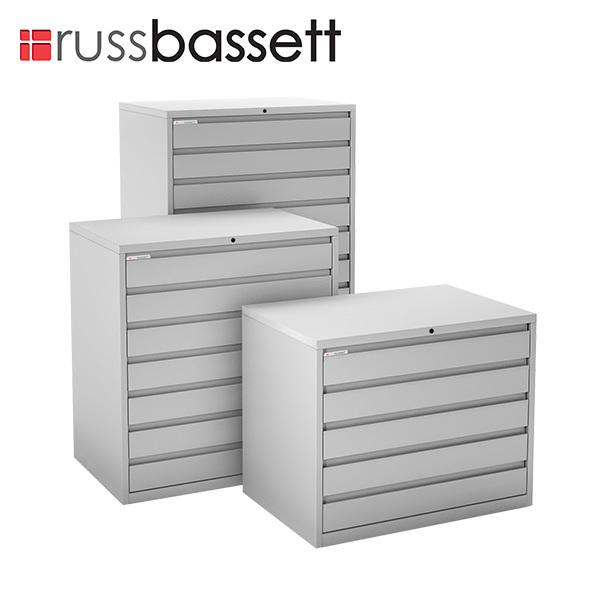 All Russ Bassett ProMedia Cabinets are equipped with fully interlocking drawers, allowing only one drawer to be opened at a time, preventing accidental tipping. The drawers also feature heavy duty ball bearing slides that provide smooth movement and full access to the drawer interior. ProMedia Cabinets have a heavy duty all-welded box construction to assure years of lasting service. Internal structure consists of an all-welded frame at the front, made of internal structural, vertical and horizontal hat sections. The four top corners are welded closed, ground and sanded to form a smooth, seamless corner. End panels and back panels are formed with offsets to eliminate raw edges where they attach to mating parts. 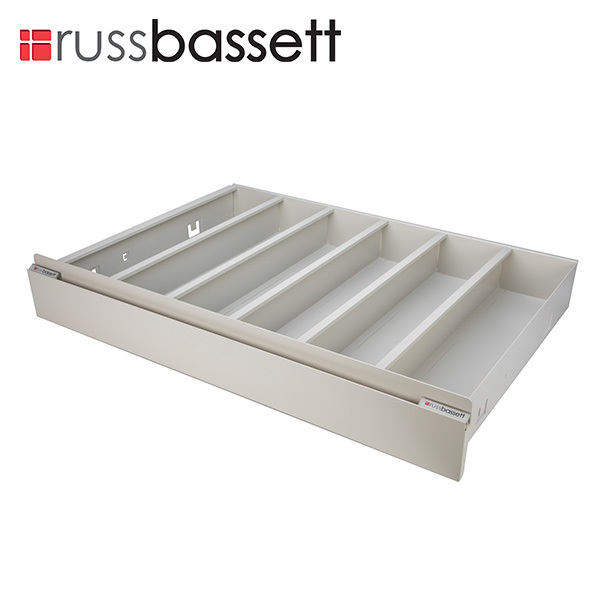 A recessed drawer-pull is integrated across the full width of the drawer front for convenient access. Precision ball bearing slides are provided to support load and maintain years of smooth operation. Cabinets are supplied in Neutral Grey as standard, but available in Black on request. ProMedia Cabinets are available in three heights. Stores LTO Storage for LTO tapes with or without jewel cases. The three sizes enables storage of between 600 and 1,200 tapes with cases or 780 and 1,560 without cases. Drawers have adjustable drawer dividers. Heavy duty ball bearing slides for smooth, quiet drawer operation. Drawer interlock safety feature allows only one drawer to be opened at a time to prevent accidental tipping. Recessed full width drawer pull provides convenient access. Where more LTO tapes require secure media storage Russ Bassett offer the Gemtrac high density media storage solution. Gemtrac stores tapes in vertical pull-out drawers. 36″ Wide x 24″ Deep x 56″ High. Includes Adjustable Drawer Dividers and 1 x BE-4X4 Bookend. Capacity: 1,200 x LTO Tapes with Jewel Cases OR 1,560 x LTO tapes without Jewel Cases. 36″ Wide x 24″ Deep x 39″ High. Includes Adjustable Drawer Dividers and 1 x BE-4X4 Bookend. Capacity: 840 x LTO Tapes with Jewel Cases OR 1,092 x LTO tapes without Jewel Cases. 36″ Wide x 24″ Deep x 29″ High. Includes Adjustable Drawer Dividers and 1 x BE-4X4 Bookend. Capacity: 600 x LTO Tapes with Jewel Cases OR 780 x LTO tapes without Jewel Cases.